On Saturday we were invited to ICT in Education Conference in LIT, Thurles Campus to showcase what we do. The theme of the conference was Global Voices. It was showing how teachers and students use technology in the classroom. We caught up with Ciaran Cannon, Minister of State for Training and Skills, after his opening address and asked him a couple of questions. Have a listen to what he tells RTY about his work, his day, education in the digital era and the important issue of education for girls especially MDG No 2. We would like to thank Conor Galvin, UCD and Pamela O’Brien, LIT Thurles for inviting us and organising the event. 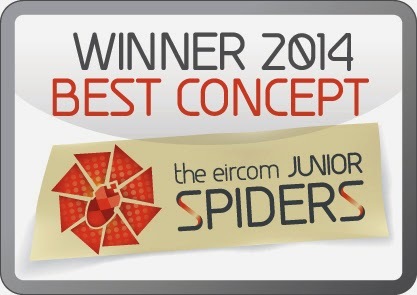 This Tuesday, Radio TY was invited to Google HQ to attend the Eircom Junior Spider Awards. 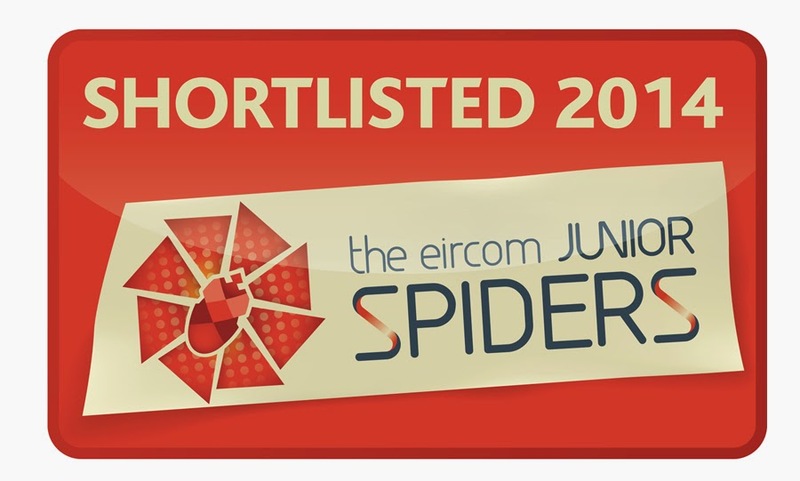 We were shortlisted for 2 awards - 'Best Project' and 'Best Concept' in the Tera Spiders category for Transition Year, 5th and 6th year students. 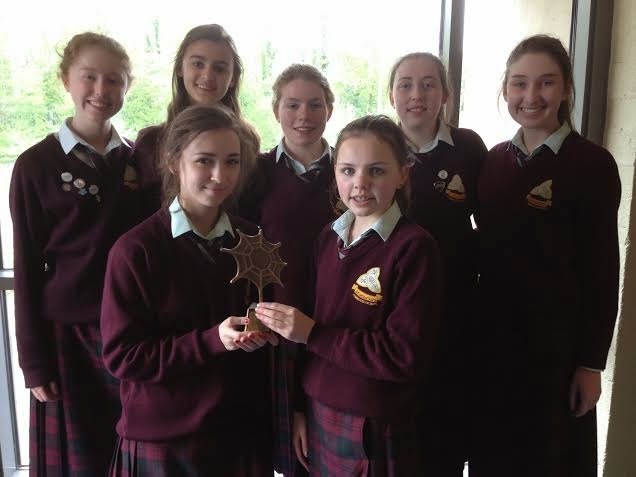 Melissa, Lauren, Eilís, Aoife, Aisling and Ciara attended alongside Mrs L on the day to represent Radio TY, and all enjoyed a day of entertainment and treats before the awards ceremony. When it was announced that Radio TY had won the award for 'Best Concept', everyone was absolutely delighted, and a little shocked!! We are so delighted to have won such a fantastic award, and thanks to everyone who is involved with and supports Radio TY! Two of the Radio TY team had also been shortlisted for their own individual TY blogs - Eilís and Lauren. Well done girls. How lucky are we to be in school? 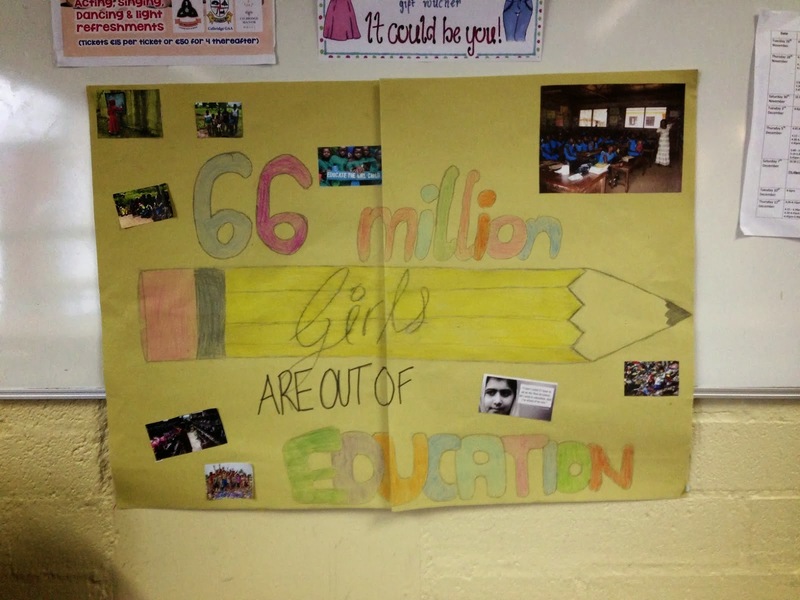 This week TY held an Awareness Week about the importance of educating girls. As well as announcements, and posters around the school, they showed a story from the film Girl Rising to 1st, 2nd, and 3rd Years in the Demo Room each lunchtime. Tickets were given out the day before to a lucky 60 students each day, and popcorn was provided! It was like our own cinema in school but with a serious topic of course. Here Radio TY team members catch up with TY's, 1st and 2nd Years and ask them their thoughts after seeing the film. 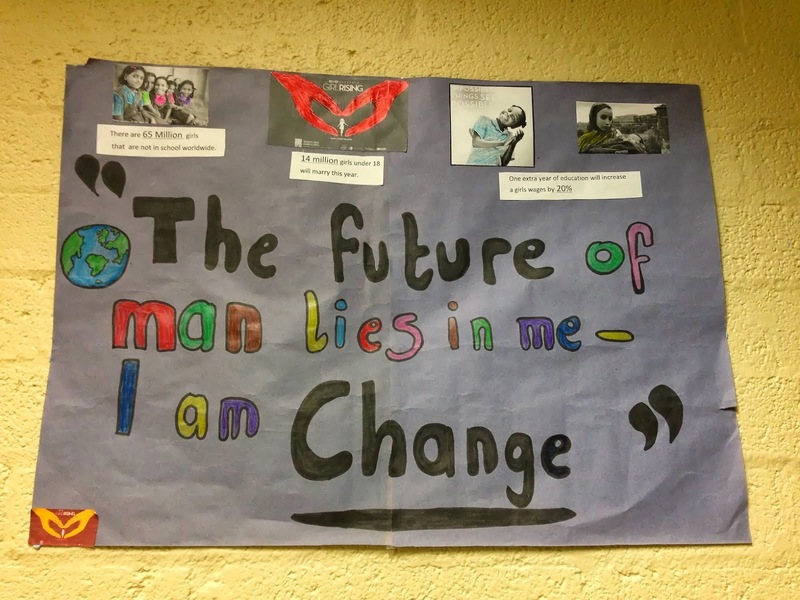 Listen here to some 1st Years who feel inspired to do something about the issue! This week on Radio TY, Aoife and Eilís caught up with Mrs. McGrath on her last day teaching at St. Wolstans. They asked her about all of the memories she has here from over the years. Ms Mc Grath leaves St Wolstan's and we are sorry to see her go, but we wish her all the best in her new job as Deputy Principal in Kildare Town Community School. This week on Radio TY, Jennifer got the chance to catch up with Aoife, who is a type 1 diabetes sufferer. She has been living with diabetes for over a year now and is coping well. In this interview, Aoife tells us about what type 1 diabetes is and what it involves. Although it was hard for Aoife at first, she reminds us that it is important to stay positive and that things will get better. There is lots of support available for diabetes sufferers, the main one being Diabetes Ireland which gives you information and advice about Diabetes. It also contains recent news and upcoming events. Make sure to like their Facebook page here to keep updated. If you have any questions, Aoife will be happy to answer them. Listen to our interview below. 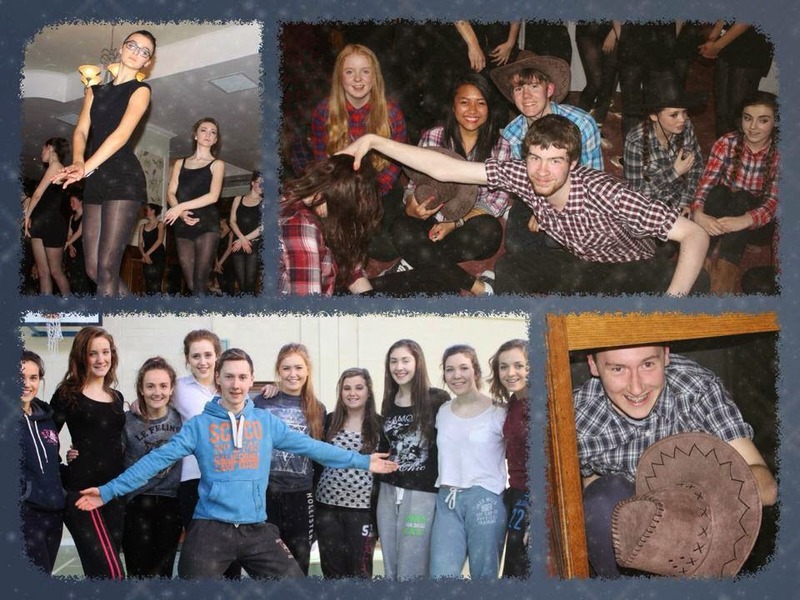 Ciara caught up with Kyle and Conor at the Saturday rehearsals for the school musical Calamity Jane. Everyone in the musical is very dedicated to the musical and attend weekly rehearsals. Ciara chatted to Kyle and Conor to discuss their roles in the musical. Kyle, who plays Bill, and Conor, who plays Francis, gave us an update on how the musical is coming along. In this interview Ailbhe and Niamh interviewed the different members of St. Raphael's Friendship Club; these include the service users, the co-ordinator and the volunteers. The friendship club is a club that was established in St.Wolstan's in 2008 where girls from the school visit St. Raphael's and play games and socialise with the service users every Wednesday on a rota. It has become very popular and it is seen that not only do the service users benefit from the club but so do the volunteers. This was a very enjoyable set of interviews to do and we hope you enjoy them too! 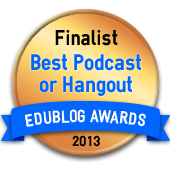 Radio TY has been nominated for the Best Podcast in the EduBlog Awards! We would appreciate any votes you can give, just click the icon on the side. It's a huge achievement to be nominated, let alone shortlisted. so we're all very excited to see our blog among so many other great blogs. Remember - Every vote counts! Rebecca's and Eilis's blogs came 2nd in each of their categories as well, so we're very happy all round. Thanks to everyone for all your votes. Last week three TY's Ciara, Aoife and Melissa went on a trip with Mrs. L to NUI Maynooth to give a talk to student teachers about Development Education. While they were there they did asked one volunteer to do a podcast. On Thursday TY's went to Citywest for a Global Citizens Student Conference that was organised by Schools Across Borders. The conference was an opportunity for the 6 schools in the SAB Global Citizens network to get together and share ideas on what it means to be a global citizen. We were also treated to a play performed by Quadrangle Productions that showed us how one person can make a difference. Rebecca, Jayne, Aoibheann, Eilís and Sophie from Radio TY were there and conducted some interviews with the NGO's who had set up workshops for us to listen to, offering advice on setting up our own mini NGO to take action. Listen to our interviews here with Concern, Trocaire, Irish Aid, and Burma Action Ireland. The play performed by Quadrangle Productions. Home Economics in TY focuses on Junk Kouture. This is a competition that allows us to work in a team to create a full outfit, made completely out of recycled materials. Students can make their costume out of a variety of materials such as bubblewrap, cardboard, paper, bottlecaps etc, but it must contain at least one electrical item. The whole process is very time consuming, but it really is a great experience. All TY's must participate in making the outfit. One student from each group is chosen by her group to model the dress for the fashion show held in the school for the other TY students to see. After the school fashion show, some students are chosen to go onto the Junk Kouture national competition, to compete against other schools. The judges are looking for a creative dress, that shows that a lot of work has been put in. To find out more about the Junk Kouture competition, visit their website http://www.junkkouture.com/index.php. Listen to our interview with TY students about preparing for the competition below. Our RTY team took the opportunity to interview some incoming first years and their parents at the school Open Morning on Saturday the 9th of October. The school community came together to prepare for the school so it looked it's best and so that the new first years would feel good about coming to St Wolstan's next September. To find out more about St. Wolstan's click here. We are happy to report that everyone seemed very pleased with what they saw of the school. Have a listen. 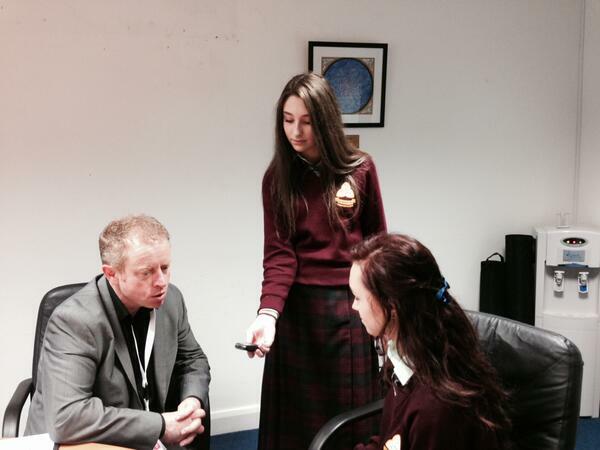 Aisling and Niamh interviewed people about their Mini Companies. There are some really interesting ideas so take a listen. Make sure to check out our podcast on iTunes (St Wolstan's TY) for more. Thanks guys. Today Aoife and Melissa interviewed Lauren and Róisín who got the lead roles in the school musical, Calamity Jane. We even got to hear a snippet of some of the songs so be sure to have a listen! They are both really excited about the musical, which we will keep you updated on. Lauren gives a character profile of Calamity and Róisín will tell you about the character of Katie. Make sure to check out our podcast on iTunes (St Wolstan's TY) for more. Thanks guys. Check out the St. Wolstan's Calamity Jane Facebook page and Blog to keep updated on the musical. Today was Halloween Dress-Up Day at St Wolstan’s, a day where each year group dresses up in Halloween costumes based on different themes. It is always a great day, and students and teachers alike always put in great effort. Melissa, Aoife, Aisling and Eilís from the RTY team went out to ask people about their costumes. 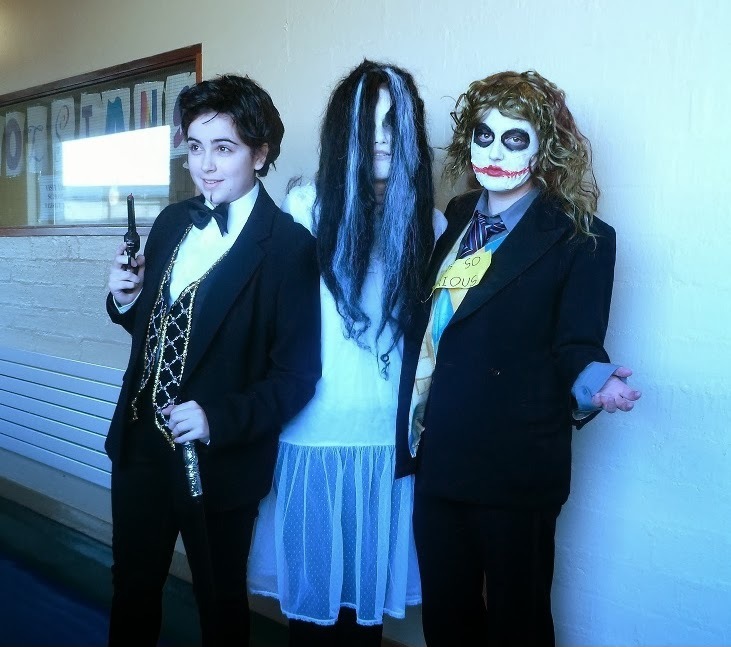 Listen to the TYs below as they explain what they dressed up as. To find out more about St. Wolstan's click here. Listen to the 5th and 6th Years explain about their costumes too. RTY members Laura and Anna caught up with Caoimhe, a fellow TY, who kindly allowed us to record her singing for our radio and blog. As you can tell she has an amazing voice and when she sings everyone can't help but stop and listen. Her arrangement of Each Coming Night by Iron and Wine changes it completely, what was once an indie song is now a bitter sweet lullaby that brings a tear to your eye. We hope to hear more from Caoimhe soon. Is the world child friendly? Tabei will find out. Today Lauren from the RTY team spoke to class Tabei about their Development Education project as part of the Schools Across Borders programme. The title they have chosen for their project is: 'Is the world child friendly?'. This is a hugely important matter and in order to cover each aspect of it, the class split into groups. Lauren went around and asked each group what they are working on. Have a listen! Check out their blog www.achildfriendlyworld.blogspot.com in the next few weeks to find out their answer.